BookBaby has long offered authors the option of limited print on demand runs, and this week they went one better. In pursuit of being a more complete publishing services company, BookBaby just launched a new combined POD+ebook distribution option which will get an author's book into many of the major ebookstores as well as into print distribution channels around the world. The service starts at around$480. That price includes a single print copy shipped to the author and print/ebook distribution, but not certain other options (cover design, ISBN, etc). That's not a bad price, given that BookBaby's ebook-only option starts at $299 (on sale for $199 until 15 February). So the combined service doesn't cost that much more. So far the costs are pretty good, but when it comes to royalties from the POD distribution it would appear that BookBaby is not quite competitive at all price points. The ALLi blog compared royalties between BookBaby and the leading POD services (Ingram/LSI, Amazon/Createspace) and found that the latter two paid more. Just so we're on the same page, IngramSpark is the part of Ingram's POD service which is focused on publishers with fewer than 20 titles as well as indie authors. I usually just refer to them as their larger sibling, LIS (Lightening Source). Not being an authors with a book to feed through the system, I can't vouch for how well it works, but at first glance the prices aren't too bad. For more details, check out the BookBaby website, or read their blog post. Lightning Source only charges $70 to set up a title (plus $12/year after that to keep it active), so BookBaby’s prices are horrendous from my perspective. To me, that’s throwing away $410. Yes. That’s one of the trade-offs with the all-in-one services; handling it yourself saves money but also adds aggravation. It’s an incorrect assumption that handling things yourself inherently adds aggravation. You’re making a blanket statement that does not hold true in most cases, otherwise no one would do anything for themselves, when in fact they do. It might not bother you, but for the average user, yes, that is a valid general rule. You yourself have stated that BookBaby are USING Amazon CreateSpace and Ingram to distribute titles via POD. So you can’t compare apples with oranges here, saying that they pay less than going direct. Of course they do. 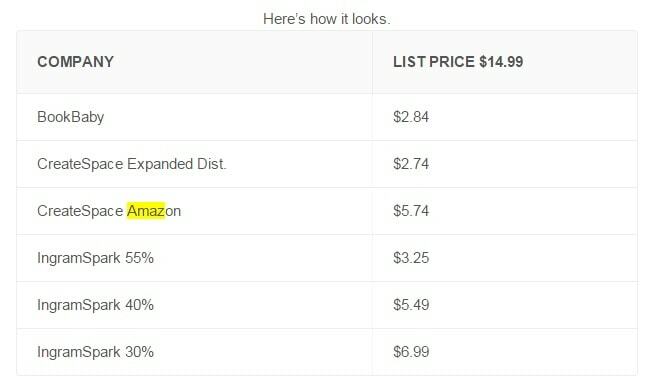 You are using their system instead of going direct to Amazon yourself. You get the advantage of their project management system. They are an aggregator, like we are (my little business is based in Australia) and we are one step in the chain removed from the ACTUAL distributor (IngramSpark is what we use too) and if you want to keep things simple by having an aggregator take care of it all, then you can’t expect to get that service and system (software platform with data, sales reports and payments) for free.